When I make deviled eggs there never seems to be enough filling for the number of egg halves. So when I was asked to develop a unique Easter recipe for Idaho Spuds, they loved my creative solution! With the addition of instant mashed potatoes there’s plenty of egg-y stuffing, and you’ll barely notice the potato blended with egg yolks, Cheddar cheese, bacon and green onion. Make these ‘devils’ ahead then pop in the microwave for a minute just before serving as a snack, or a side with salad or soup. And, you can make them yolk-less too for lower cholesterol. Just add a touch of turmeric for color. Plain instant mashed potato flakes was one of the first instant foods developed for consumers over 60 years ago, and is one of the simplest packaged foods available. Just dehydrated potatoes, plain and clean, a real food. (Flavored flakes do have some additional ingredients). Potato flakes are super convenient and easy to customize with pesto, roasted or toasted garlic, and any kind of cheese. Or stir in diced tomatoes, shredded zucchini or spinach for extra veggies. The flakes can be used for a quick and nutritious thickener in soups and gravies too. Basic American Foods (based in my home town Walnut Creek, California and family owned since 1933) was the first to develop an instant potato that hydrated with hot water. Their supermarket brand is Idaho Spuds. These warm potato stuffed eggs are like a combination of deviled eggs and twice-baked potatoes. For a lower cholesterol version, make them yolkless, and add a little turmeric for a yellowy color. Skip the bacon and add diced red bell pepper and jalapeno peppers to taste. *Easy-peel hard-cooked eggs: Bring 1-inch of water to a simmer in a saucepan fitted with a steamer basket, if available. Place eggs in basket, or carefully lower into water with a slotted spoon. Cover pan; simmer 12 minutes for large or 13 minutes for extra large eggs. Remove from water. Serve warm or immediately plunge into ice water. Refrigerate until ready to use. Prepare instant potatoes following package directions for 4 servings, replacing butter with the 1/4 cup mayonnaise. Stir bacon bits, cheese and green onions into warm potatoes. Separate egg yolks from whites; mash yolks into potatoes. Or omit yolks and add a little turmeric for color to the potatoes. Spoon or pipe potato mixture into hollows of eggs, filling generously and evenly dividing between all the egg halves. Place eggs on serving plate. Sprinkle tops with bacon bits or paprika if desired. Microwave on high power 1-2 minutes to heat through just before serving. Serve warm. Recipe developed by Rosemary Mark for Idaho Spuds. Photo by Kelly Burgoyne. 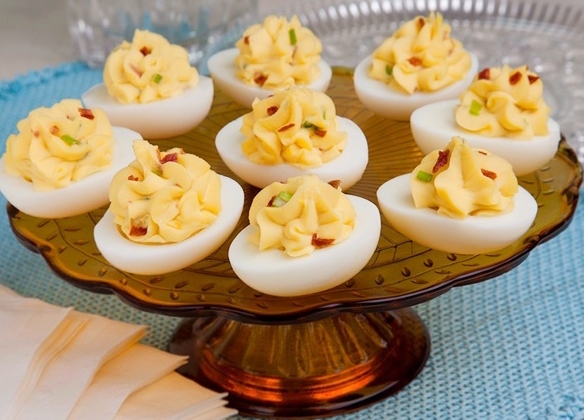 Rosie, what a great idea to use potato flakes in deviled eggs! I use them often to thicken gravies and sauces because they never clump up as flour does. Cool. Interesting idea. And a healthy alternative, too, for those watching their egg yolk consumption. The turmeric works like a charm, doesn’t even look like the yolks are missing. Flavor is still great too. I’m excited about having these this coming Sunday. Yum! Love it! 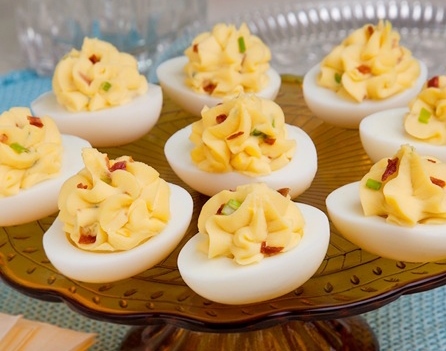 There never seems to be enough filling for the deviled eggs–this sounds like a great idea. Ooh, potatoes in the eggs. That’s a nifty addition. Bet it makes them even creamier. Yes, the filling is moist and surprisingly light. A few leftover from my Easter lunch today will make a nice supper at my house tonight!